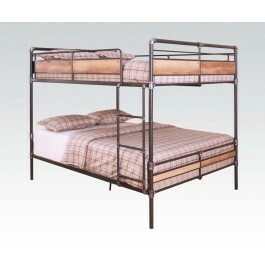 The Brantley ll collection features queen over queen bunk beds with metal tube frames. Queen size beds add comfort with more space for your growing kids. Access guard rails make it easier to climb up and down. The wood design rails are not only decorative but also help to provide an element of safety. In addition these beds can be converted into two queen beds.